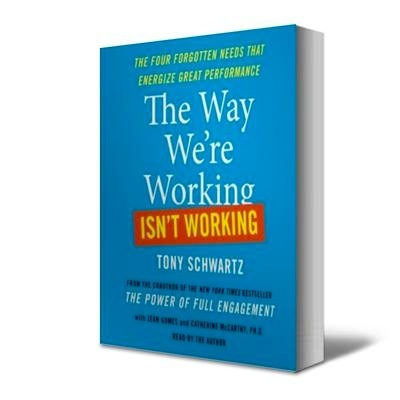 If I had a choice to rename Tony Schwartz’s book ‘The Way We’re Working Isn’t Working: The Four Forgotten Needs That Energize Great Performance‘, it will be to ‘The Way We’re Living Isn’t Working’. That’s only because much of his expositions in this book actually refers the way how 1) the modern workplace is now so overwhelmingly hectic – doing too much in less time – so much so it saps too much of our energy, 2) the way we’re living doesn’t help us regain that lost energy, and finally 3) we don’t fulfill our potential because of this. Yes, today we lead busy, unfulfilled dastardly lives. Unsurprisingly, Schwartz, who is CEO of The Energy Project and the co-author of the bestselling The Power of Full Engagement: Managing Energy, Not Time, Is the Key to High Performance and Personal Renewal, argues that it’s all about managing your energy. Having consulted for many corporations such as Google, Sony, Ford, Toyota and even the Los Angeles Police Department about effective energy management, he believes we should maintain physical health (such as eating right, resting well, getting regular exercise etc), emotional, mental and even spiritual health so we can be happy and productive. Men aren’t machines, he says. Finally, Schwartz also has an entire section dedicated to searching for and clarifying the reader’s sense of purpose in life, for that is ultimately where energy is channeled towards. A leader needs to recognize it’s not how much time you and your people put into work, it’s how much value each team member is creating that determines productivity. Promote a balanced lifestyle, and not just about work-life balance. Create new ways of working that support and encourage your people to eat right, work out regularly, and get enough sleep. Establish a healthy emotional climate. Balance between challenging team members to exceed themselves, and rewarding them for it. Introduce practices that improves focus – banning emails and the use of mobile phones in meetings, etc. Create a set of values in your company that everyone truly believes in. A clearly defined purpose bonds and drives collaboration and action. To get more insights, you just gotta read the book. ‘The Way We’re Working Isn’t Working‘ can be difficult to plow through at times, but there are some interesting leadership lessons in it. Many thanks to Tony Schwartz and his literary agent Kevin Small for sending me a copy of the book.